Lake Iseo or Iseo lake (Italian: Lago d'Iseo [ˈlaːɡo diˈzɛːo]; Eastern Lombard: Lach d'Izé) or Sebino [seˈbiːno] is the fourth largest lake in Lombardy, Italy, fed by the Oglio river. It is in the north of the country in the Val Camonica area, near the cities of Brescia and Bergamo. The lake is almost equally divided between the Provinces of Bergamo and Brescia. Northern Italy is known for its heavily industrialised towns and in between there are several natural lakes. Lake Iseo retains its natural environment, with its lush green mountains surrounding the crystal clear lake. 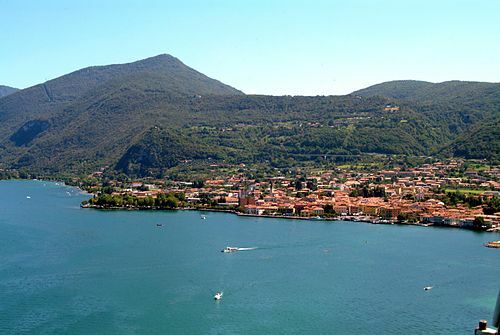 There are several medieval towns around the lake, the largest being Iseo and Sarnico. A notable tourism sector has emerged. A road has been carved into the side of the mountains that travel to circumnavigate the entire lake. In the middle of the lake there are Montisola island, Loreto isle and San Paolo isle (which compound the Monte Isola municipality). There is easy access via the regular running lake ferries. The Floating Piers, an art installation by Christo and Jeanne-Claude, was open to the public at Lake Iseo for 16 days in June and July 2016. The level of the lake is regulated by the dam of Sarnico, built in 1933 in Fosio. The work, built in concrete and steel, is managed by the Consorzio dell'Oglio which divides the water withdrawn between irrigation uses and hydroelectric uses. Two smaller islands, Loreto and St. Paul, are privately owned. ^ "Lake Iseo Ferryboat". Navigazione Lago Iseo. Retrieved 14 July 2016. ^ Clemente, R. (4 November 2013). "Sarnico: la diga compie 80 anni Difende il lago, irriga la Bassa" [Sarnico: the dam is 80 years old(. It) defends the lake, irrigates the low (Bergamo and Brescia provinces)] (in Italian). L'eco di Bergamo. Wikimedia Commons has media related to Lago d'Iseo. This page was last edited on 3 March 2019, at 08:37 (UTC).